Yumi Chen is an accomplished concert violinist, professional pastry chef, and mathematician. 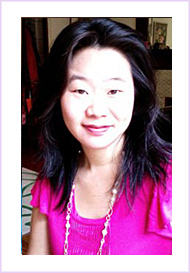 In 2003, she redefined herself as a jewelry designer and entrepreneur, launching her online store at yumichen.com. While growing up in Scarsdale New York, Yumi was a serious violin student, a pursuit requiring both creativity and great precision. Years of success in competitions and performances might have led Yumi to a future spent in concert halls, but her academic interests instead brought her to Boston to study mathematics. While earning her degree, Yumi discovered that the food industry - pastry, in particular - offered a career path which combined her creative talents with her attention to detail. After earning her B.A., Yumi moved to Europe, studied pastry at the illustrious Ritz Escoffier in Paris, and spent several years working in New York and Boston's best restaurants. In addition to earning accolades from a top New York food critic, Yumi learned how to run a successful business. Just as her future seemed certain, however, Yumi was injured in a work-related accident, which required a long recovery period. And so it was by virtue of an accident that Yumi began her own jewelry business. Her experience as a pastry chef gave her a unique sense of color and balance; her time in Europe, which included an inspiring visit to Venice, exposed her to the world's most beautiful glass; Yumi's years of experience in the food industry taught her how to run a successful business; her background in mathematics and music imbued her with an appreciation for precision and care - qualities which are found in each beautiful piece of jewelry she makes. Yumi Chen has also been featured in New York Magazine, StyleEnvy.com and StyleBakery.com! Yumi Chen Designs has something for everyone! 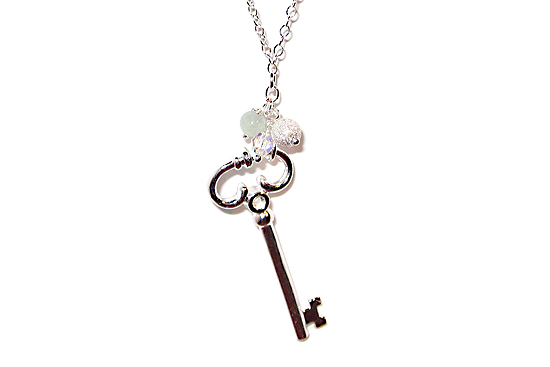 Handmade sterling silver necklace adorned with natural jade, clear quartz and Swarovski white pearls. 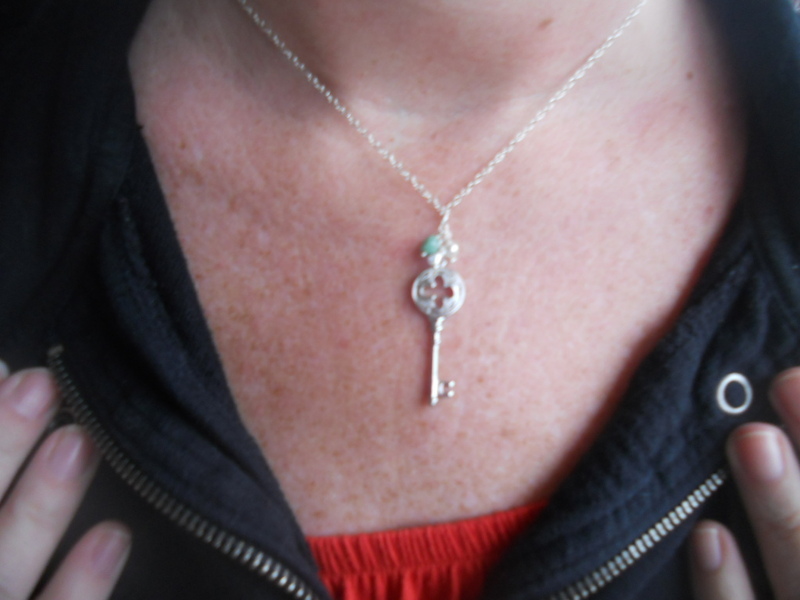 It is such a beautiful piece ~ here is a photo of it on my neck!! Win a $50 Gift Certificate to shop with Yumi! LIKE Mommy's Moments on Facebook! Follow Yumi Chen on Twitter! Follow Mommy's Moments on Twitter! Contest is open to US Residents age 18 years and over. All entries will be verified and must be received by 11:59pm on April 2nd, 2011. Winner(s) will be chosen by random.org and will be contacted by email and posted on blog within 48 hours. Winner(s) will have 48 hours after announcement to respond or a new winner will be chosen. I LOVE the green jade rose ring! I like Yumi Chen on Facebook. My favorite Yumi Chen piece is the Circle of Light Golden Lariat from the Silver and Gold Collection. Gorgeous necklace. my fav piece of jewerly on her site is the "I love you heart necklace, very beautiful!! my fav piece of jewerly on her site is the "I love you heart necklace"
i love the "The Jewel of Eternal Life" at yumi chen's! I love the Flora & Fauna collection wildflower venetian glass pendant with sterling silver necklace !! I LIKE Yumi Chen on Facebook as Shilo Beedy and told her you sent me. I sent her a friend request on facebook(its a personal page not a group), and told her you sent me, and thank you for the giveaway! and tell them that Mommy's Moments sent you by!! "Liked" Yumi Chen on Facebook and told her you sent me. Favorite piece is the Acacia Crystalline Green Swarovski Crystal Earrings. Fruits of the Spirits bracelet is what I like !